Avid had to create a set of high-quality High Definition codecs back in the mid-2000's to allow them to move High Definition video content over their I/O connection pipe of choice for the time, a domestic 400Mbs Firewire cable! This was the birth of DNxHD codecs. DNxHD became a very popular finishing and editing codec as it was a Media Composer friendly format and the compression also allowed users to store HD content on drives which, at the time, had limited performance and capacity. With recent UHD formats becoming more widely used in cameras, users now need to edit in 2K, 4K and even 8K. As a result, Avid revised its codecs in line with this demand and released an updated DNxHR codec set. While this new codec has been released this does not mean the end of DNxHD. Let's look at them both and what they are suitable for. Avid DNxHD 444: For 1920x1080 progressive projects. Full resolution, 10-bit 4:4:4 RGB video sampling and high bit-rate is a visually loss less compression. This codec is only seen in projects made in the RGB colour space. Avid DNxHD 220x: For a high-quality image in YCbCr-colour space for 10-bit sources. The data rate is dependent on frame rate. For example, 220Mbps is the data rate for 1920 x 1080 30fps interlaced sources (60 fields) while progressive sources at 24fps will be 175Mbps and at 25fps will be 185Mbps. Avid DNxHD 220: For high-quality images when using 8-bit colour sources, the data rate remains the same is the 10-bit version detailed above. Avid DNxHD 145: For high-quality mastering when using 8-bit lower data rate sources such as HDCAM and DVCPRO. 145Mbps is the data rate for 1920 x 1080 30fps interlaced sources (60 fields). Progressive sources at 24fps will be 115Mbps and at 25fps will be 120Mbps. Avid DNxHD 100: For optimal visual impact where workflow speed and storage capacity are important factors. Suitable replacement for DV100 compression and offers lower processing overhead than AVC-Intra 50/100. Sub-samples the video raster from 1920 to 1440 or from 1280 to 960 to reduce compression artifacts, providing a balance of reduced compressed bandwidth and visual quality. Progressive sources at 24fps will be 80Mbps and at 25fps will be 85Mbps. Avid DNxHD 36: High-quality offline editing of HD progressive sources only. Designed for projects using an offline/online workflow due to large quantities of source media and/or needing more real-time preview streams for craft editorial or multicamera editing. With the exception of DNxHD 444, the number at the end of the DNX codec is the data rate required for a single stream of video. DNxHD 120 requiring 120Mbs for example. As we have seen already, Avids DNxHD codecs were designed for HD workflows up to 1920x1080. The later DNxHR codecs take the leap into 2K, UHD, 4K and 8K formats. So what codecs are available? 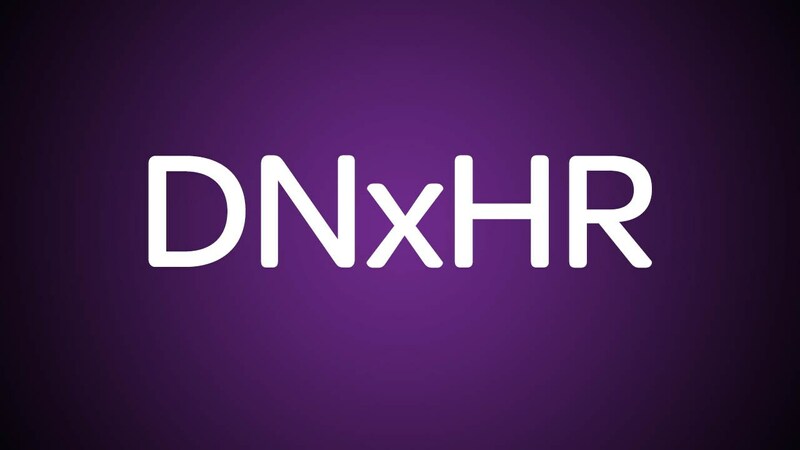 DNxHR LB—Low bandwidth 8 bit; ideal for remote workflows and saving storage; LB 1/4 resolution and LB 1/16 resolution also available for the most bandwidth/space-constrained workflows. As can be seen, the codecs are named and don't allude to their required respective data rates which makes them a little harder to account for in terms of disk performance and file size on disk. 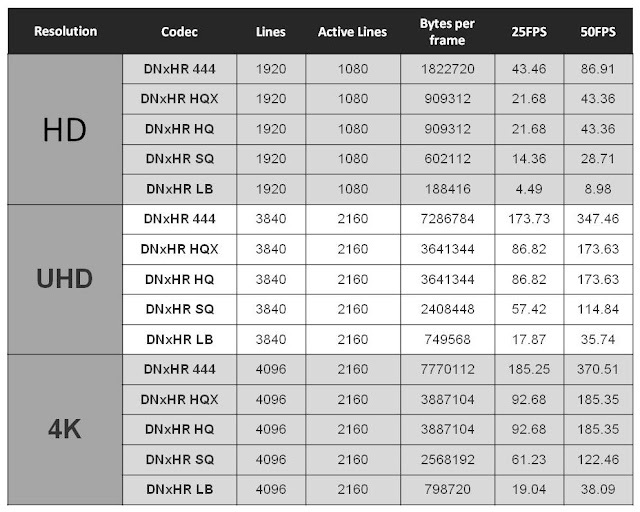 The table below shows examples of the data rates you should expect from the DNxHR codec family. The last 2 columns are datarates in MBs. 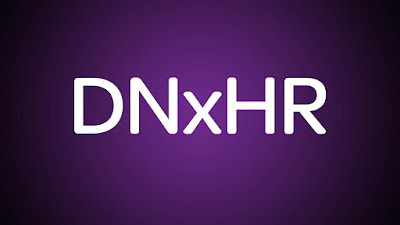 It's also worth knowing that the DNxHR codecs in a High Definition project are backward compatible with DNxHD. But as the DNxHD codecs are still available in HD projects I would recommend sticking with these where possible and use DNxHR in UHD and above codecs. If you want to dive deeper into these codecs take a look at the Avid article here which also offers additional resources.